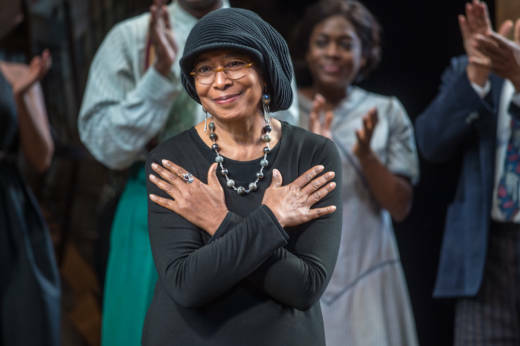 The Pulitzer Prize and National Book Award-winning author of the "The Color Purple," "The Temple of my Familiar" and many other beloved works has now issued "Taking the Arrow Out of the Heart." The book gathers 69 of her poems in both English and Spanish, the latter courtesy of translator Manuel García Verdecia. "I just think it's great for us to acknowledge that people are not finished," Walker says. "We're not finished!" On the first line of "Loving Oakland"
for a long time: an urban Paradise. Walker: In fact, it's happening as we speak. So many huge buildings, apartment buildings, forcing the people out. There are a lot of broken-hearted souls in Oakland who've lived there all their lives. I just moved there myself a couple of years ago, but I've known people who've lived there for a long time. Simon: Do you wonder what the poem will sound like, say, five years from now? Walker: No. I don't. I don't even know I'll be here five years from now. I mean, what I'm trying to express is just my absolute delight in finding a place — I'm such a country person. I mean, I actually really live on a farm. But you know, Oakland has a soul as a city. It has a real spirit, and when you lose it, it's major. It's a big deal. I live part of the year in Mexico. I've been living there like that for almost 30 years, I think — yeah, since the late '70s. You know, I'm busy writing in English, so it's been real hard to get my Spanish up to speed. And I sometimes am frustrated because I can't really explain to my friends what it is that I do. I just want to be closer to them, and I don't want to always be the one who is, you know — I have something to share but I can't share it, because I can't really speak the language. Feeling, depth of feeling, absolute piercing of the heart — and the wanting to touch someone and someones with a reality that something is necessary to be done, to be looked at, to be understood, to be loved, to be cared about. And especially in this book, I'm thinking more about children, and this world where they must ... it's hard to even think about how most of the children on the planet are dealing with what is happening. I mean, it gives me nightmares. So I'm really writing out of that feeling of wanting people to be very aware of what we are inflicting on each other, and especially on the children. On the poem "Necks of Clay" and listening to "imperfect humans"
Does this make us mad? Walker: I can. That's the only kind there is! I mean, really. And I think accepting that is taking us a long way forward. OK, you're not perfect, and I'm not either, and you're really not perfect. But what are you trying to tell me? And then maybe we can go somewhere. Simon: I love it when you say "I've always preferred them / myself." Walker: I do! I do, I do, I tell you, it's just so — it's so human, to be imperfect.